Does it refer to St. Andrews Hospital? email the editor on editor@billericayhistory.org.uk or post a comment on the site. 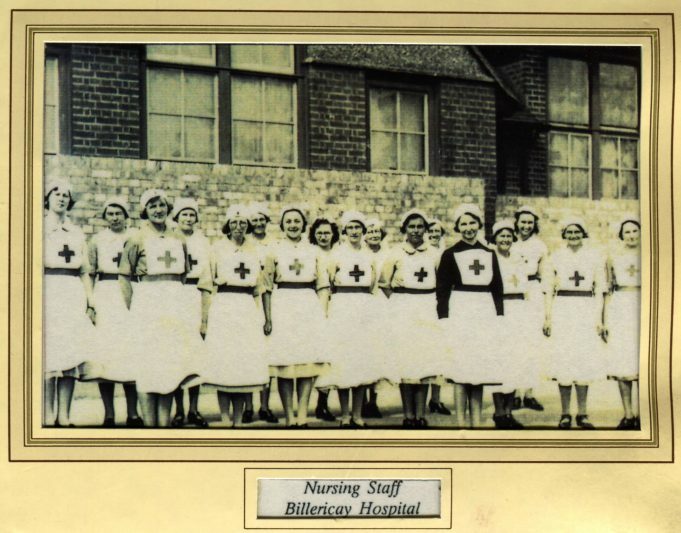 Does anyone have any photos from the late sixties early 70’s when we wore butterfly caps and starched aprons – the students wore lilac pin stripe uniforms, staff nurses light blue and sisters navy. I thought it was her, I and my brother used to deliver a Christmas card to her each year when we were around 10/11, our father was Dr Dan Cuthbert a GP in Western Road. That is a picture of sister Cinders, with whom I worked in the maternity block, (she was a midwife) during my nurse training. The photo would have been taken around 1939–41 as after that, the uniform was without the red cross and headgear was different too, with the introduction of the ”butterfly cap”. It also looks to have been taken around the back of the old Charles ward, near the sewing rooms, a favourite place for taking photos. How I loved those days!! I am not certain but the lady in the dark sleeves may be Sister Cinders who used to live in the small wooden fronted cottages where Norsey Road joins the High Street. She was in her 90s in around 1976.